MANAGUA – Nearly 30 years ago I had lunch with Bruce Cockburn as preparation for a feature I was to write about the singer-songwriter’s tour of Guatemala and Nicaragua. Having lunch in the old Hotel Nova Scotian, I asked Bruce about his trip, and it was more than an hour before I got to ask the second question, not that I needed to ask any more. Cockburn was not the only pop culture artist to get swept up the aftermath of the Sandinista revolution. Rolling Stone magazine still considers the Clash’s Sandinista to be among the top 500 albums of all time. It seemed everyone was watching Nicaragua. Thirty years on you don’t hear as much about this Central American nation wedged between Costa Rica to the south, El Salvador and Honduras to the north, bordered east and west by the Atlantic and Pacific Oceans. As part of my preparations to come here I spoke with someone at my bank, who wanted to know how one spelled ‘Nicaragua’ and where it was. Where to begin, the devastating 1972 earthquake? The revolution? The Contras? The Somoza dynasty? Or do you go back to the 1930s, the U.S. occupation and Sandino himself? Nicaragua today is the second poorest country in the hemisphere after Haiti. Almost 80 per cent of Nicaragua’s population lives on less than U.S. $2 per day. It is among the most likely locations in the world to experience a natural disaster. Is it any wonder that the volcano appears to be a stand-in for the country’s national emblem? Myself and OPSEU Board Member Jeff Arbus are here to tour the country over the coming nine days – and we’re planning on bringing you along. Don’t worry about the travel shots – we got them for you already. We’re here with a delegation from Horizons of Friendship, a unique non-governmental organization committed to promoting social justice and sustainable development in Central America and Mexico. While Canada has produced many hard-working NGO’s that do incredible work on the international stage, Horizons is unusual in that it is based in rural Cobourg, Ontario. 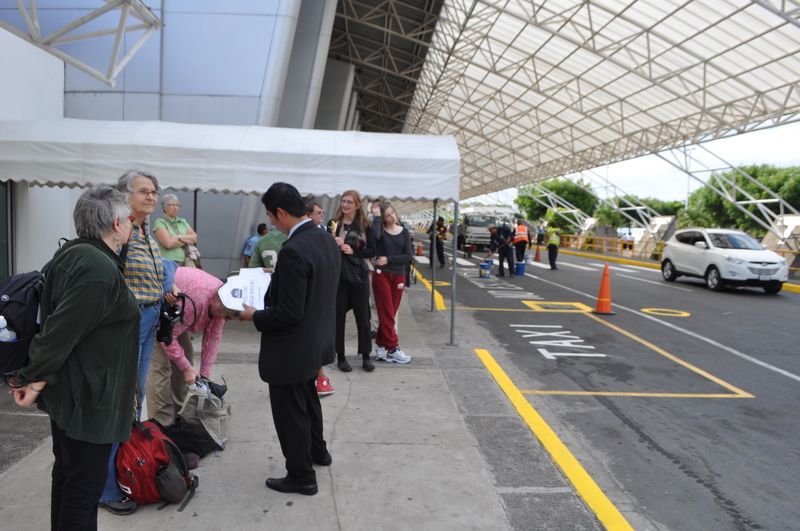 The contingent from Horizons of Friendship outside the Managua airport. Day one started at Pearson International Airport at 3 am, a Tim’s in hand. It’s ending in a hotel a few hundred metres from the Managua airport. There’s been time for a dip in the pool, a quick cerveza and dinner. Tomorrow the real fun begins. We hope you’ll follow the adventures of the two of us in the coming days. Travel has an odd way of not only shedding light on the destination, but also on adding perspective about the places we come from. Please come along! I hope you both have a safe journey, take a few moments to enjoy yourselves. Opseu members are so proud of the work being done internationally, you represent us well. Jeff Region 6 misses you already!!!! This is OPSEU’s fifth “exposure tour” with Horizons of Friendship. OPSEU is a proud supporter of Horizons’ work with local development groups in all six Spanish-speaking countries in Central America plus the province of Chiapas in southern Mexico. Horizons of Friendship is an international development organization based in Coburg, Ontario. Jeff Arbus, Social Justice Fund committee member, and Executive Board member from region 6 is participating in the tour along with Campaigns Officer, Rick Janson.